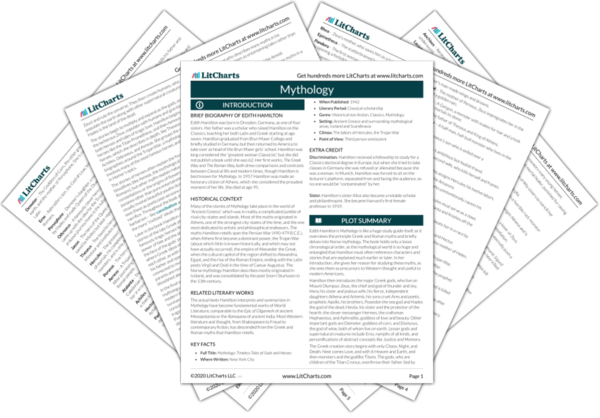 Instant downloads of all 946 LitChart PDFs (including Mythology). 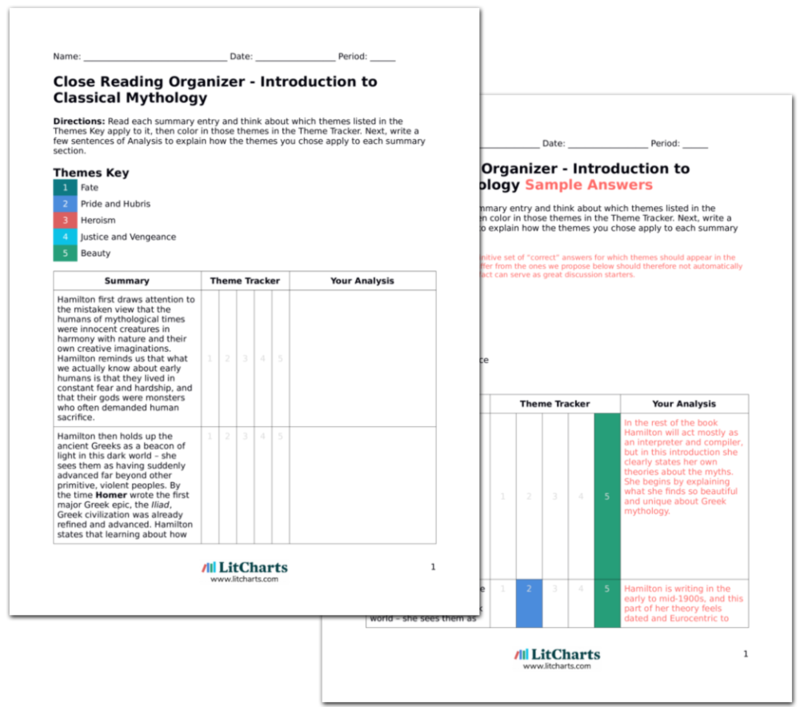 LitCharts assigns a color and icon to each theme in Mythology, which you can use to track the themes throughout the work. Hamilton takes this story from the Latin writer Apuleius, who, like Ovid, wrote myths as entertaining stories rather than statements of belief and importance. The protagonist of the story is Psyche, who is one of three princesses and is so beautiful that people stop worshipping Venus (Aphrodite) and instead start worshipping Psyche. Many Roman writers were not as concerned with the nature of fate and morality as the Greeks, but more interested in creating entertaining tales of love and beauty. A mortal being worshipped as a god is always a recipe for trouble, as the often inconsistent gods are consistently jealous. Venus is understandably insulted, and she sends her son Cupid (Eros) to punish Psyche by making her fall in love with the most disgusting creature he can find. But when Cupid sees Psyche, he himself falls in love with her, and Venus’s plan fails. Psyche falls in love with no one. Though she is beloved and worshipped by all, no nobleman proposes to marry her, even though both her less-beautiful sisters have been married already. Beauty overcomes everything else once more, and the poet exploits the interesting irony of Cupid himself being struck with sudden passion. Though Venus is the goddess of Love and Beauty, nothing can save a mortal (even a beautiful, loving one) who makes a goddess jealous. Psyche’s father, the king, goes to Apollo’s oracle to ask how he can find a good marriage for his daughter. Cupid has already spoken with Apollo about his desperate love for Psyche, so Apollo tells the king that he must leave Psyche at the top of a hill, where she will be wed by a powerful winged serpent. This is another example of a poeticized human sacrifice. Woman were clearly seen as valuable mostly as marriageable objects, as Psyche is seen as a failure because she is unmarried, though she is beloved by all. The king and all the people grieve at this news, but they have no choice but to obey the oracle. Psyche sits on the hill, terrified, but then Zephyr, the West Wind, carries her away to an opulent palace. Voices speak to her and tell her to enter the mansion and bathe and feast. That night, she feels someone beside her in bed and he says that he is her husband, but she is forbidden to see him. The oracle of Apollo will play an important role in many myths, often acting as a vehicle for unavoidable truths and inevitable, tragic fates. Many of the myths hinge on simple, seemingly random commands from a gods to a mortal, like Cupid forbidding Psyche from looking at him. 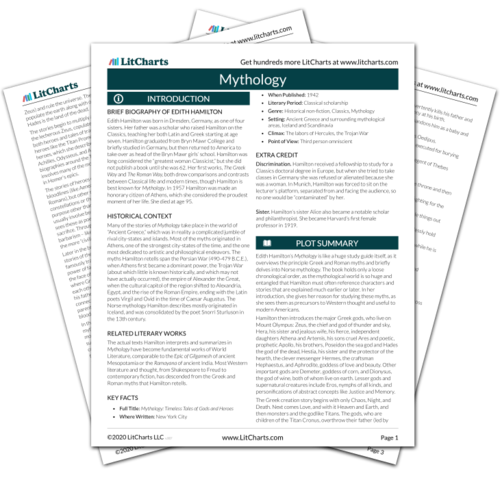 Get the entire Mythology LitChart as a printable PDF. Time passes, with Psyche spending the day alone in the palace and the night with the husband she never sees, but she is happy and comes to love him. One night her husband warns her that her sisters will be passing nearby, and Psyche begs him to let her see them. He agrees, but says that this will end in tragedy. The next day the sisters greet each other joyfully, and then Psyche shows them her palace and tells them about her husband. The sisters are jealous of Psyche’s good fortune and they form a plot to ruin her. The power of love is at the center of this story, and for a myth (and culture) that focuses so much on beauty, it is interesting that the godly Cupid wins Psyche’s love without using his physical beauty. The characters in the myths are often warned that their actions will inevitably lead to tragedy, but they usually act anyway. The sisters manage to convince Psyche that her husband is probably a horrible monster, as she has never been allowed to see his face. They force her to agree to their plan – she must light a lamp and look at her husband while he is sleeping, and if he is a monster, she must stab him. Disobedience is emphasized here as it is in many myths. Despite the occasional randomness and cruelty of the gods’ justice, the Greeks and Romans found some moral security in simply clinging obediently to their commands. Psyche is wracked with doubt, but she carries out her sisters’ plan. The lamplight reveals that her husband is the impossibly beautiful Cupid, and Psyche is so overcome with wonder that her hand shakes and a drop of hot oil from the lamp falls onto his shoulder. Cupid wakes up and flees the house, acting betrayed, and he goes to Venus’s chamber to heal his wound. The power of love depends on obedience and trust in this story, and Psyche is punished for her lack of both, although it seems totally understandable that she would want to see her own husband. Like with Pandora, a woman is punished for her curiosity. Psyche is crushed with shame and sadness, and she determines to wander the earth seeking after Cupid. She eventually goes to Venus’s house. Venus is delighted to torment Psyche, and sets her an impossible task to “help her find a husband.” First Psyche must sort a huge amount of seeds in one evening, but some ants pity her and help her succeed. The impossible tasks that Venus sets for Psyche become recurring motifs, like the “Labors of Hercules.” Being given difficult tasks is an important part of the Greek idea of heroism, and the “Hero’s Quest” motif. Venus is angry as Psyche’s success, and sets her more tasks. The next is that she must fetch golden wool from a flock of fierce wild sheep. Psyche despairs, but a river reed speaks to her, comforting her, and tells her where she can find the sheep’s wool snagged on thorny branches. Next Psyche must fill a flask with water from a dangerous waterfall at the source of the Styx, but an eagle appears and fills the flask for her. Psyche here becomes a hero with more agency and drama than many of the mortal women in the myths about love. The strength of her love overcomes all obstacles, and she receives last-minute help from the natural world, as many heroes do. For her last task Psyche must go to Hades and convince Proserpine (Persephone) to put some of her beauty in a box. On her way a tower speaks to her and tells her how to get to Hades, and to appease Cerberus with a piece of cake. On the way back, Psyche is overcome by curiosity and she looks into the box she carries, as she wants more beauty to win back Cupid. The box seems empty, but then Psyche falls into a deep sleep. Psyche becomes one of the many mortals to enter Hades and return. Again like Pandora, she is punished for opening a forbidden box. Psyche’s main “flaws” seem to be a totally reasonable amount of curiosity and disobedience, but she is punished for these nonetheless. Cupid, who is finally healed of his shoulder wound, appears at last and wakes Psyche. Then he goes straight to Jupiter (Zeus) and convinces him to make Psyche an immortal. Immediately Venus approves of their marriage, and the story ends happily with Love (Cupid) and the Soul (Psyche) united forever. Psyche’s story ends happily despite her trials, and love overcomes hardship again. The story also becomes an explanation story for abstract concepts like Love and the Soul. Cosby, Matt. "Mythology Part 2, Chapter 1." LitCharts. LitCharts LLC, 3 Mar 2014. Web. 25 Apr 2019. Cosby, Matt. "Mythology Part 2, Chapter 1." LitCharts LLC, March 3, 2014. Retrieved April 25, 2019. https://www.litcharts.com/lit/mythology/part-2-chapter-1.